The lunar meteorite NWA 2727, which contains evidence of moon water, according to a new study. A mineral that requires the presence of water to form has been discovered in a lunar meteorite, a new study reports. The find suggests that hidden caches of water ice potentially useful for human exploration might be hidden under the surface of the moon, study team members said. Moganite, a crystal of silicon dioxide similar to quartz, is known to form on Earth in specific circumstances in sedimentary settings from alkaline fluids. It has never before been detected in samples of lunar rock. Kayama and his team believe the mineral formed on the surface of the moon in the area called Procellarum Terrane, as water originally present in lunar dirt evaporated due to exposure to strong sunlight. According to Kayama, there is a good reason to believe that, deeper under the lunar surface, crystals of water ice could be abundant, protected from the harsh solar rays. "For the first time, we can prove that there is water ice in the lunar material," Kayama told Space.com. "In a moganite, there is less water, because moganite forms from the evaporation of water. That's the case on the surface of the moon. But in the subsurface, much water remains as ice, because it's protected from the sunlight." Scientists already knew that there's water on the moon. For example, NASA's Lunar Crater Observation and Sensing Satellite detected the stuffin a shadowed crater near the moon's south pole. And India's probe Chandrayaan-1 recorded evidence of water in the thin atmosphere above the moon's surface. Schematic of the history of precipitation of moganite and subsurface water ice on the moon. But, according to Kayama, there has been no evidence so far of the presence of water in the subsurface at mid and lower latitudes. "Many people think that remote-sensing spacecraft only found the evidence of water around the poles simply because we can't see under the surface below a few millimeters," Kayama said. "This is the first insight into water in the subsurface zone." The researchers estimate that the water content in the lunar soil under the surface could be up to 0.6 percent. If that's right, future moon pioneers could theoretically extract about 1.6 gallons of water per 36 cubic feet (6 liters per cubic meter) of lunar rock, Kayama said. "This value means that water is very abundant," he said. "It would be enough for future astronauts and people that could perhaps live on the moon in the future to extract enough water to cover their needs." Kayama said that the widespread presence of water ice under the surface of the moon in other areas than just the poles would mean future explorers would have easier access to the resource, which could also be used to make rocket fuel for missions to asteroids and other planets. "We wouldn't need to bring all the water for drinking and the fuel to return to Earth or to travel to Mars, for example, with us from Earth," Kayama said. "If water is abundant in the lunar subsurface, we can easily use it." Kayama and his colleagues analyzed 14 lunar meteorites using sophisticated methods, including micro-Raman spectroscopy and electron microscopy. They found moganite in only one of those samples. However, they said, concentrations of the mineral suggest that it was unlikely to have formed when the meteorite was already lying in the African desert, exposed to terrestrial weather. 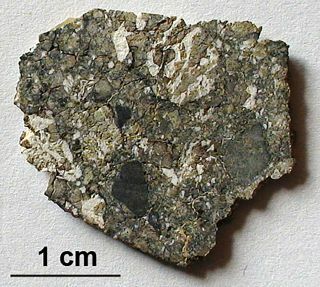 "Moganite formation as a result of terrestrial weathering can be excluded, because this scenario would imply a wide distribution of moganite in the sands of the hot desert where the meteorites were found," the researchers wrote in the new study, which was published online today (May 2) in the journal Science Advances. "This case has not been reported. Moganite is readily and completely lost via water alteration at ambient pressure." Kayama hopes that Japan's space agency JAXA will go ahead with plans to launch a lunar sample-return mission in the future, which would allow researchers to attempt to detect moganite in other lunar rocks.